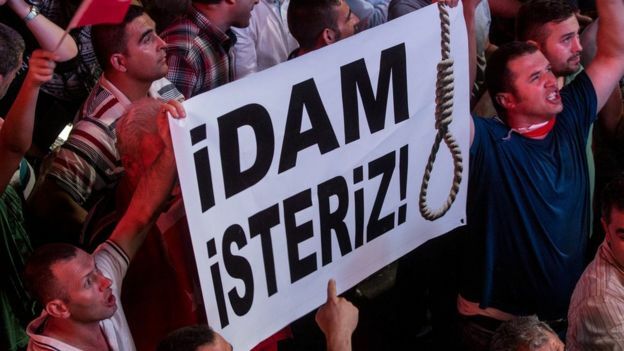 President Recep Tayyip Erdoğan said on Saturday that legislation to reinstate capital punishment, which was abolished in 2004, will soon be taken to Parliament by the Justice And Development Party (AKP). “It is soon. … Don’t worry. … It is soon, God willing. … Our government [AKP] will bring it to Parliament. I believe that it will be approved by the legislature. When it comes to me, I will approve it,” said Erdoğan after a group of people chanted “We want the death penalty” during a ceremony in Ankara on Saturday. “The West says this and that. … Sorry… What is important is not what the West says but my nation,” added Erdoğan, in reaction to criticism from the US and the European Union (EU). Erdoğan and the government have been pushing for reinstatement of the death penalty since a failed coup attempt on July 15. This article originally appeared in Turkish Minute on October 29.